Update 2 : I improved collisions and fixed the "keep perfectly vertical" way of cheating. Here is Combo Pool, my entry to p8jam2. It's a game where you throw colored marbles against each other. If two marbles of the same color make contact, they merge and upgrade to the next color. Your lifebar diminish with the number of balls on the field. 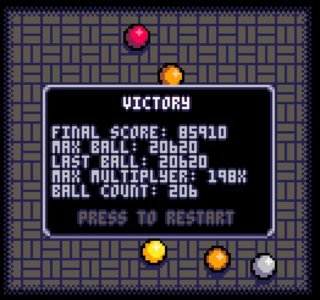 If you lifebar is empty, you enter in a sudden death mode, and your last ball must save you by removing some balls. Can't play out right now as I'm on my iPhone. Quite fun! Graphics are beautiful! You could maybe have balls combine into larger balls too? with different mass. What I do for scoring in my physics puzzle game is once getting points, start a combo timer (say 3 seconds) and any points you get during that period will restart the timer and increase the multiplier. It is really cool and feels very polished. It will definitely be one of the games I keep on playing. A two player mode would be cool. Add another player on top perhaps and take turns to shoot? I would love face off against a friend, take the easy shots away from him. To avoid spamming, you might wait until all balls are stopped to allow a shot. You could easily check for that if you have a variable that keeps track of the movement/speed for each ball. 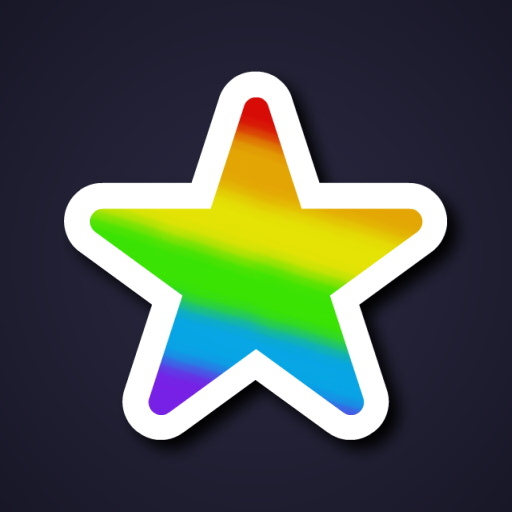 @impbox: I would much rather have score dependent on the color of the balls combined. Timers are cool, but I feel this game would play better if you take your time to aim. But I agree about the bustamove controls. Would make it more fun. *spends 10 minutes carefully aiming each shot, trying to keep the total populate of balls down. *points cannon to the right wall and holds down the trigger bada-bada-bada-bada-bada-bada PINK BOOM! I started with a "left+right" control ala bust a move, but I found it a bit slugish, it's hard to make it precise and at the same time alow fast direction change. With the cursor, I though you could aim at a precise point. But maybe I will try "left+right" again or leave it to the player's choice. 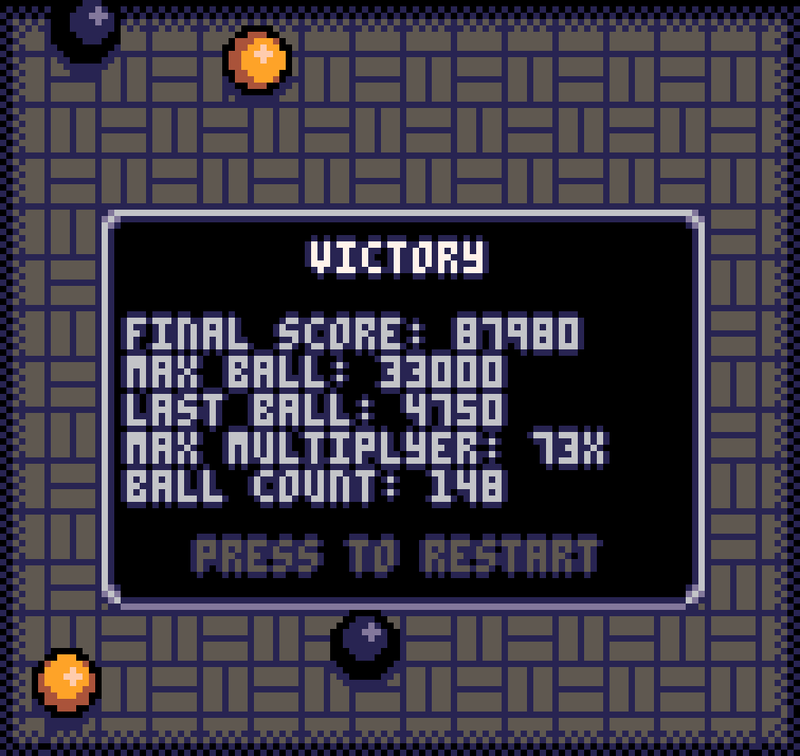 For the combo system, I think I will have a score multiplyer that goes up each time you touch a ball, but you only make score when you merge balls of same color. So the ideal move is to make several rebound against other balls and finaly merging. @Level27Geek : I didn't even think about a two player mode, but now I absolutly need to make it hapen, thanks for the idea. @johnesco : yes, that is an issue right now. I will add a gauge to make you cautious with the rate of balls you throw, and maybe add a free mode with no restriction. You where right impbox, rotating control are better, especialy with a laser to see where you throw. I also added a precise mode when you hold the button, the ball leaving only when you release. Now I need to make sounds, improve graphics and add a two player mode. Very cool. I just spent a ton of time throwing balls around. 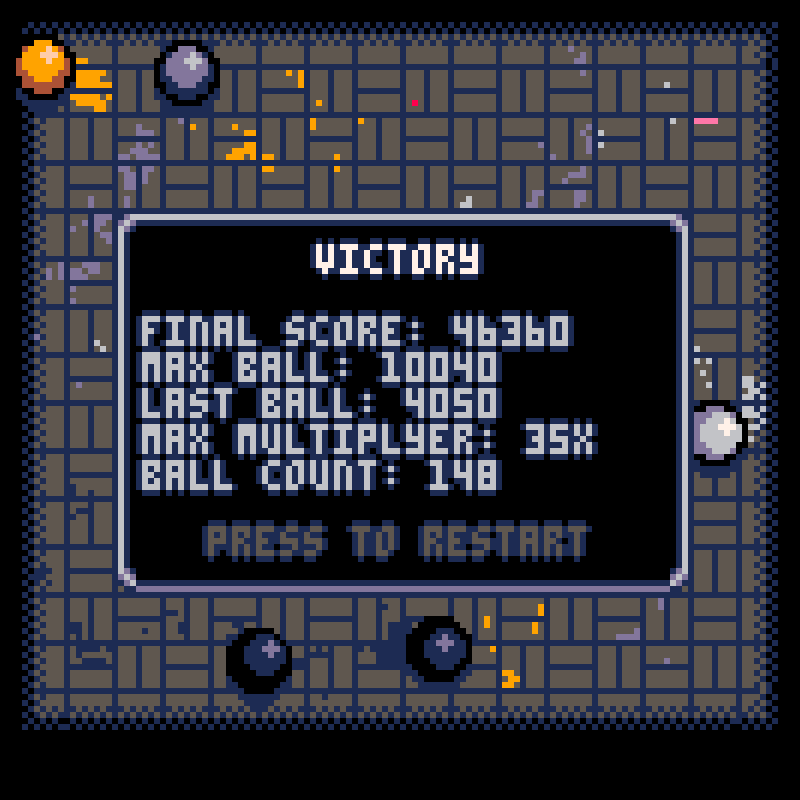 I actually made it to the end with the pink balls, woo! The paint trails are awesome. Only a few things that I felt were a little weird or not obvious. First, the targeting felt way to fast. Just one press of the key and the sight goes really far, wish it was slower - or maybe if you hold X+Direction and that is slow and other is fast? The other thing is I'm not quite sure how you lose...? I felt for a while I was just knocking balls around trying to match colors. I mean, that in itself was fun but I never felt like I had to be careful or anything...just let em fly! And maybe that's the idea...just kind of expected some challenge outside of just angling balls off each other. 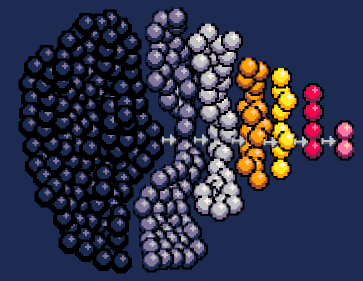 I find it amazing how just shifting some pixels on the balls made them look like they're rolling. A lot to learn from this one, bravo! The trick to make precise shoot is that when you hold the button, the rotation is slower and without acceleration. I wanted to keep a fast rotation to make fast direction change possible, but maybe I should reduce it. Regarding losing, it all depend on the difficulty chosen. In endless you cannot win or die, in easy it's prety difficult to die (you have to spam for a while). In hard (I should rename it "normal" maybe) it become difficult to live as the game advance, you need to avoid having too much balls. In extreme, I never made it to the end, but I know it's possible. I need to make a tutorial or something in game to explain all the subtle mechanics. I agree here with morningtoast, you could add real pool holes so maybe there's a chance you could lose a few balls or alike (? Just to make it a little more challenging. I love the colors and everything, looks really good! Congrats! Ah ha...I just played Difficult and died a few times, so I now see the challenge...you don't want too many dark balls! And this time I noticed holding down Z while using the arrows to target does move slower, so that's nice. I think you're right that changing Difficult to Normal would help. Funny though, because on any game I was play Normal start...but in absence of Normal, I go Easy. Never really paid attention until just now. Great work though - as always! Dunno if the victory screen counts joins made after the pink impact, though, heh. This is super satisfying. Kinda like a Threes mixed with Pool balls and score attack. Lots of fun to play! So good. Will probably play this a bunch! Love all the improvements you've made over past couple days. Like the instruction page and things feel a little tighter. Well done. Top 5 favorite right now, jam or not. This is absolutely great. Just won. I love the color trail behind the balls. Wow, kudos. wonderful!! feels very polished now! looks beautiful! I finished it on hard! Really loving this one! Great idea, presentation and most important - great gameplay! Soooo good!!! Great concept and amazing execution!! You sir, rock! This is really great and addictive. Would deserve better music, but that is sucha minor detail on such an awesome game. May I ask for a [P] option to stop the music ? I made a version with no in-game music, so you can play as long as you want without headhake. I shouldn't have included music anyway, as I didn't have enough time to make it good. I also cleaned and uploaded my first step in the making of the game. It's a very simple sample of collision and physics for circles. It can be a basis for a snooker game. Just finished this. I had two final balls last time, too! That will teach me. Great game. Two player mode would be great, and some extra challenges as others have described. I'd also love to see a "puzzle" mode where you have to figure out the correct order to shoot the balls in. The only minor issue is with the physics: 1) narrow angle collision the ball moves the wrong way, 2) slow moving ball hit results in ball moving at faster speed than collision. Maybe due to the maths and accuracy limitations with pico8? Hopefully they can be solved in subsequent versions. There's a really cheap way to win, if you just shoot vertically from the very start and never vary. Other than that, looking forward to playing this on Pocket Chip! You are right johnesco, I indeed forget to make the cursor slightly offseted at start to avoid this. 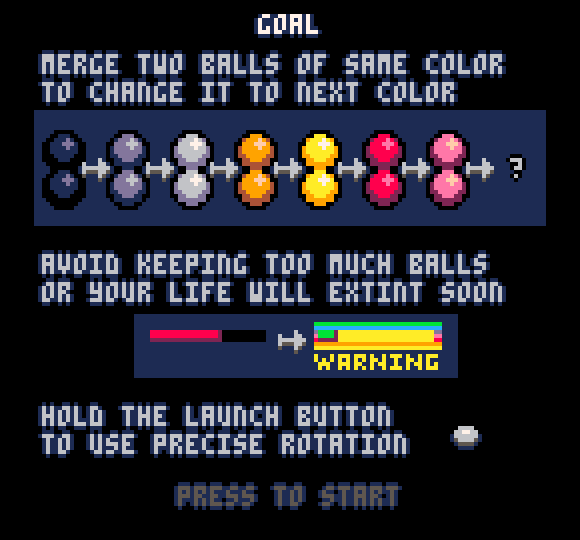 It's interesting that it doesnt seem to work in hard mode because the starting balls are enough to make you loose if you don't merge them. Fantastic - this was a lot of fun! Winning on hard feels so good...a lot of close calls though. Although it's interesting that I never once considered my score, it was all about just finishing. I guess now I need to learn how to score points! Really loved it. It's of of these game I'd like to play and replay on my PocketCHIP once I'll have it. It has an impressive level of polish, and the real fun is here, plus totally respecting the jam theme! One of my favorites so far. You are very true johnesco, my chart was slightly underestimating. But seeing it like that is a bit frightening. It becomme clear that you have to play for a while to finish the game. @todkon: Thanks for liking the music, even if I am not realy proud of it and would life to change it. I think the bbs only expose the most recent upload for a thread, no matter what cart is at the top. I even had the issue when I uploaded the "simple collision" sample cart. Even if I uploaded it as a new cart and then inserted in this thread, it became the new version. So I could reupload the original version. I realy should add a toggle music button so every body can play on the same version. Multiplayer might be a good feature to add at a later date. For example, a player at the top/bottom or left/right, and each player can each shoot a ball at the same time, having to wait for the other to shoot before they get another shot. You could start with neutral gray balls, but then change them to say, red or green, depending on who shot the ball that made them collide. Please keep developing and tuning this! 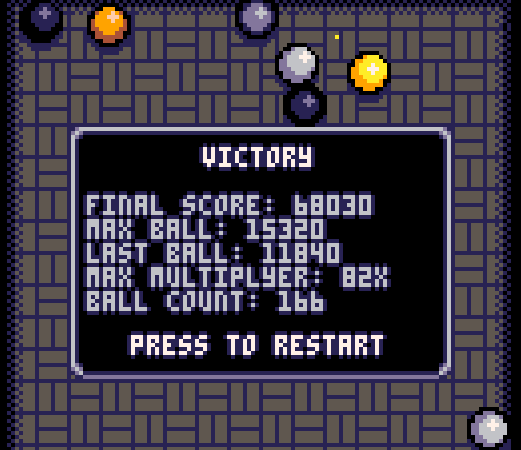 It feels too easy even on hard to make me want to replay it, and something to make endless more rewarding would also be appreciated (just spamming balls is just as effective as any deliberate strategy). Otherwise, it is an amazing concept and very well executed. EDIT: I tentatively take back my statement about Hard mode; I think I got lucky on the first couple plays! EDIT2: I now re-instate it. I'm now 2/4 wins on Hard. @Jupiter_Hadley : Thanks for the video, it's very nice. 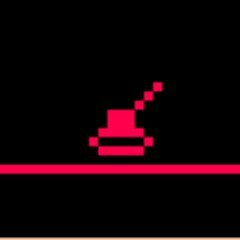 @curiousepic : yes I could tweak the difficulty, especialy because in easy you dont even know there is a life bar if you dont spam. I could add a "sudden death" difficulty, where each ball must make a connection or you die. It would be so hard though. I'm currently making an android version, as I think the gameplay could work well. I want to add challenge levels where there is a fixed situation you have to resolve in the smallest number of launch. Yes! Nice I love challenge modes like that. 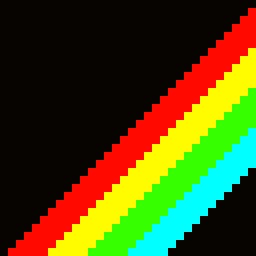 Any publicity for any Pico-8 game is publicity for all the games; because network effect. Yes, they even explain Pico 8 a little, it's cool. Now I'm realy motivated to make that android version. It's nearly done but I have some UI to add.